Home » Best Dressed at 2011 Daytime Emmys » Joan Rivers » MyLifetime Recaps » Nick Verreos MyLifetime.com blog » Project Runway » Project Runway Recaps » Project Runway Season 10 » PROJECT RUNWAY.....Season 10 Project Runway Recaps: Where's Joan Rivers When You Need Her? 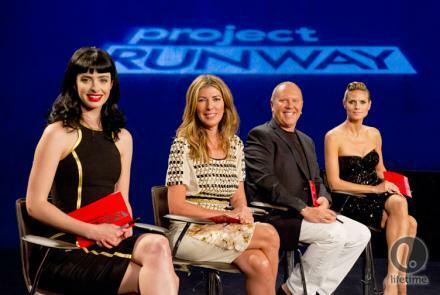 PROJECT RUNWAY.....Season 10 Project Runway Recaps: Where's Joan Rivers When You Need Her? This week's Project Runway Season 10 Challenge was to Create a Red Carpet Look to be worn at the Emmy Awards. 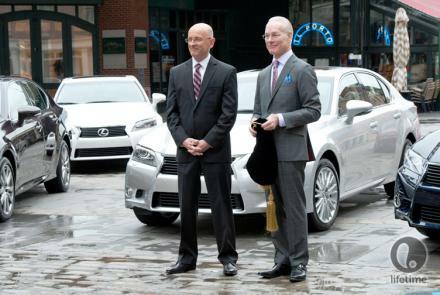 The official name of the challenge was the LEXUS Team Challenge--hello, the show has to pay the bills! Somehow they created an addendum to the challenge that would somehow make it justifiable for LEXUS to be involved--yes, kids, the designers were "inspired" by the colors of these fab LEXUS GS automobiles...yeah, right. This season's designers were given their Red Carpet clients and no, it was't Sofia Vergara or Claire Danes. Not so muchey as I like to say. Remember the mustard-mess of a dress Season 1's Wendy Pepper made for Nancy O'Dell (photo above). Yeah, bless O'Dell's heart--she smiled through it and was a good sport but you know she was like "NEVER AGAIN!". Nina, Michael Heidi, and guest judge, actress Krysten Ritter were there and really--nothing against the lovely Miss Ritter--but I was hoping it was going to be Joan Rivers. She would have let these Season 10 contestants HAVE IT. Especially those who were all "I HATE designing 'Red Carpet'..." Yes, I am talking to you Alicia and Raul! The Bottom Two were cutie (I am renaming him "Drama Queen Christopher" after this episode) Christopher and Andrea BA MA MFA Katz and the design they created for Anya. I do LOVE a pageant gown and a slit--as long as it's not DANGEROUSLY close to her nether-regions--and this dress was. Poor Anya would have been SLAMMED by the "Fashion Police" --or at least moi on TV Guide's Emmys Fashion Wrap! But the worst was the dowdy dirndl halter dress that pointy-haired Raul and dreadlock'ed Alicia created. Bad with a Capital "B". Poor Mila. This look really aged her and made her look like a Mother-of-the-Bride as opposed to a Red Carpet Diva. 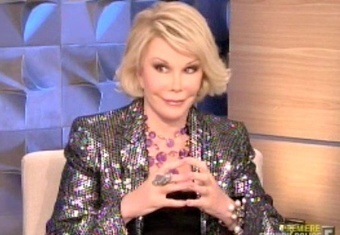 "Where's Joan Rivers When You Need Her?" Seven Teams of two were created — Christopher/Andrea, Sonjia/Nathan, Elena/Buffi, Ven/Fabio, Gunnar/Kooan, Alicia/Raul and Dmitry/Melissa. Now, who would these teams be designing Emmys red carpet creations for? Heidi? Nina? Sofia Vergara?! Nope, darlings. Remember the debacle years ago when Season 1 Winner Jay McCarroll created La Klum a gown for the Emmys and she ended up not wearing it? (Oops). And the mess Wendy Pepper made for Nancy O'Dell to wear to the Grammy's as a result of a challenge she won? Yeah, in other words, not such a good history of these collaborations. So, instead, the show brought back seven past Runway contestants and winners — Season 9 Winner Anya, Season 6 Winner Irina, Laura Bennett, Kenley, Mila, April Johnston and Valerie Mayen (who?) — to be the Red Carpet Sacrificial Lambs ... I mean clients. Team Elena/Buffi got Laura Bennett as their red carpet client which immediately scared me. If Laura and those two were the last people stuck on an island, she still wouldn't choose them to make her a dress (But, alas, she has no choice). Laura is elegant Manhattan chic, while Elena is Lady Gaga futurama and Buffi is just tacky-licious. Strong-headed Elena is delegating Buffi to steaming/pressing assistant status while she's just running around stressed and panicked. She's also complaining about the lack of time they are given to make an evening dress. Really Elena? 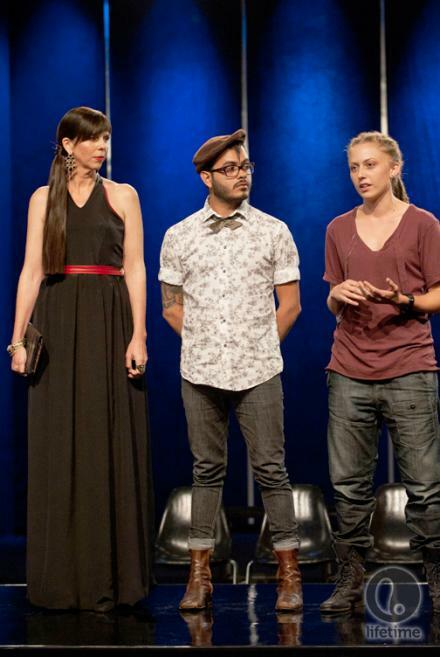 What part of "Project Runway" did you NOT understand? These kids, they slay me. And make sure to let me know YOUR "Two Cents"" on the site--I read ALL your comments!!! 1 Response to "PROJECT RUNWAY.....Season 10 Project Runway Recaps: Where's Joan Rivers When You Need Her?" We met briefly a few months ago at FIDM San Diego at the 3 Days of Fashion. i don't expect you to remember me, but my daughter was Glitter Lips in the fashion show you hosted. I want to tell you again how phenomenal you are at the work you do with young people. You have a real gift for fashion and for inspiring people do to and be their best. I love to read your recaps and totally agree with your take on the strange judging of the top dresses of Episode 3. I wanted to share with you a blog I wrote about this episode. I went in a totally different direction, but I hope you enjoy it anyway!